to reveal the complex mechanisms of diabetes mellitus. somal dominant mode of inheritance. strain currently known as the NOD mouse. of diabetes [7-9], but the exact causes are still unknown. region distal to D7Mit189 . There are some reports of kidney injury in Akita mice. microglia from 12 to 36 weeks of hyperglycemia [22,23]. KKAy mouse, are most commonly used in such studies. quently transferred to B6 inbred strain background . nificantly different from lean mice. and showed the glucose-lowering effect (Figure 2). ferred to the C57BL KS/J inbred strain by backcrossing. insulin receptor (IR) phosphorylation in liver of ob/ob mice. ob/ob mice. JTT-551 was administered to the mice for 7 days. cantly different from the control (ob/ob mice). sural nerve and ventral root, and axonal atrophy [41,42]. cytes and acellular capillaries were observed . 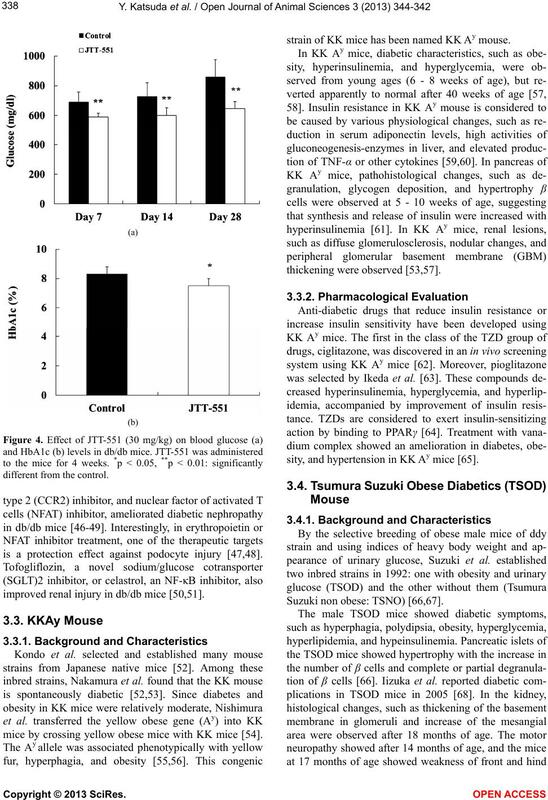 hibitors, show anti-diabetic effects in db/db mice [43,44]. good glycemic control in db/db mice (Figure 4) . is a protection effect against podocyte injury [47,48]. improved renal injury in db/db mice [50,51]. mice by crossing yellow obese mice with KK mice . strain of KK mice has been named KK Ay mouse. sity, and hypertension in KK Ay mice . Suzuki non obese: TSNO) [66,67]. tion were observed. Kondo et al. pathogenesis of human diabetes and its complications. veloping novel drugs for diabetes and its complications. etiology and development of new therapies. 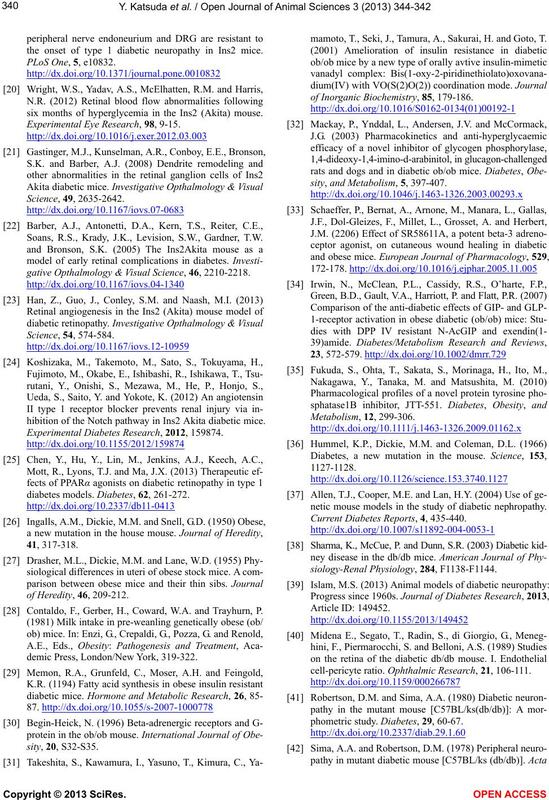 Wild, S., Roglic, G., Green, A., Sicree, R. and King, H.
Clinics of North America, 34, 199-219.
diabetic strain of mice. Experimental Animals, 29, 1-13. Makino, S., Muraoka, Y., Kishimoto, Y. and Hayashi, Y.
the NOD mouse. Diabetologia, 33, 635-637. (NOD) mouse: Implications for human type 1 diabetes. 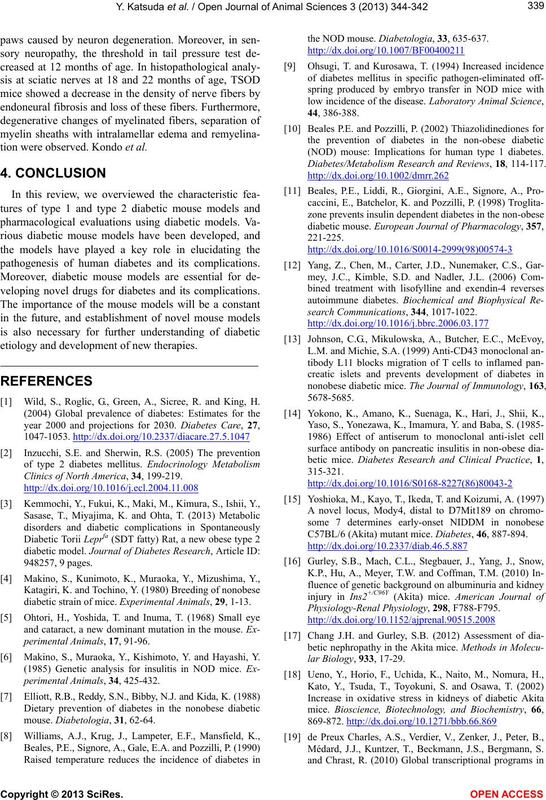 Diabetes/Metabolism Research and Reviews, 18, 114-117. C57BL/6 (Akita) mutant mice. Diabetes, 46, 887-894. Médard, J.J., Kuntzer, T., Beckmann, J.S., Bergmann, S.
the onset of type 1 diabetic neuropathy in Ins2 mice. 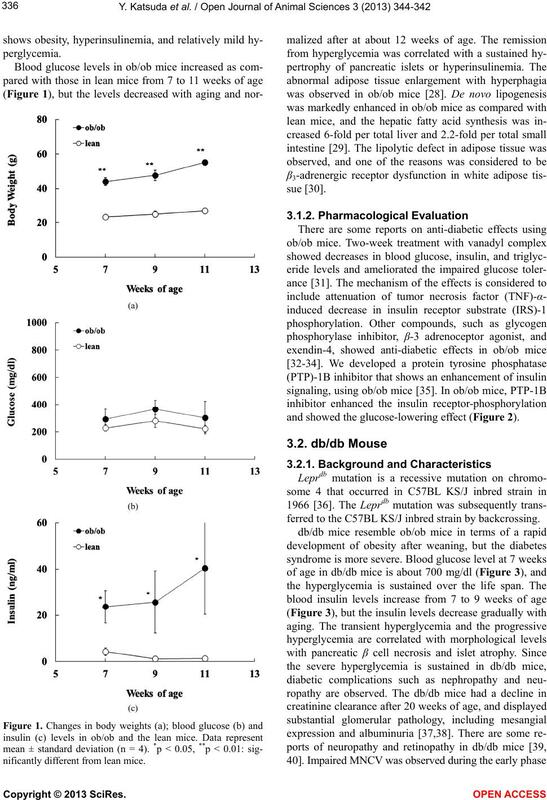 six months of hyperglycemia in the Ins2 (Akita) mouse. Experimental Eye Research, 98, 9-15. Soans, R.S., Krady, J.K., Levision, S.W., Gardner, T.W. gative Opthalmology & Visual Science, 46, 2210-2218.
hibition of the Notch pathway in Ins2 Akita diabetic mice. 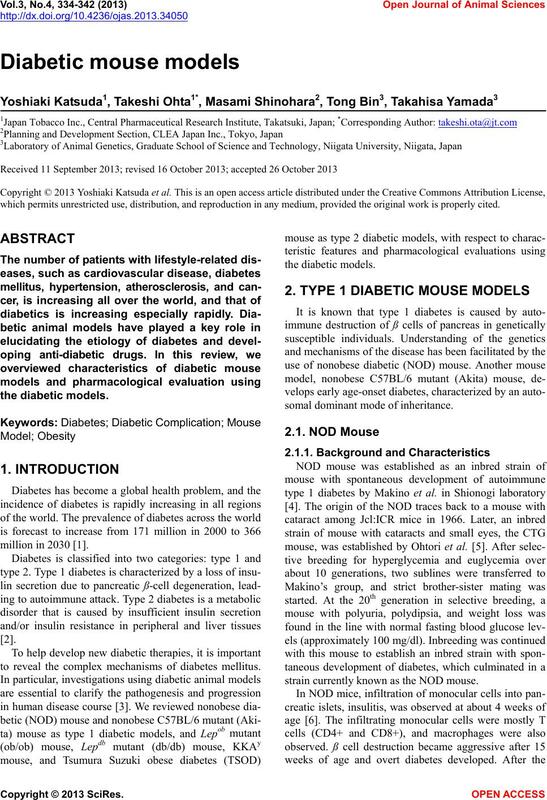 Experimental Diabetes Research, 2012, 159874.
diabetes models. Diabetes, 62, 261-272. Contaldo, F., Gerber, H., Coward, W.A. 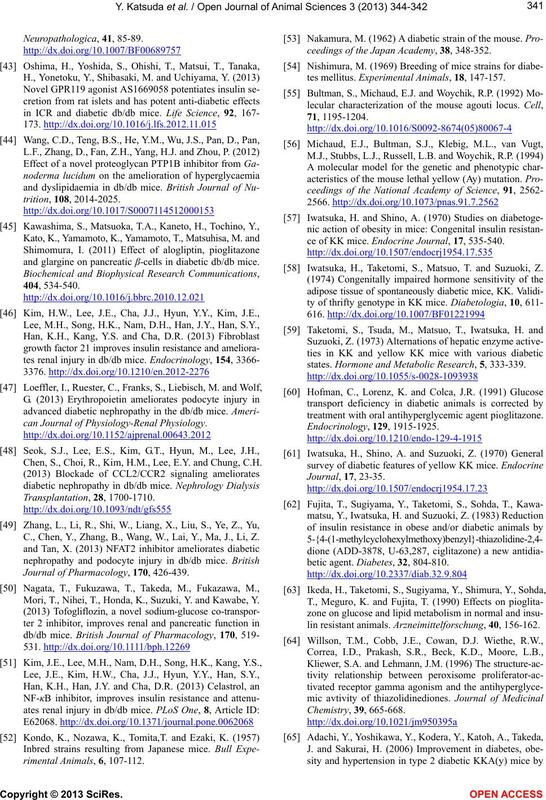 and Trayhurn, P.
demic Press, London/New York, 319-322.
mamoto, T., Seki, J., Tamura, A., Sakurai, H. and Goto, T.
of Inorganic Biochemistry, 85, 179-186.
sity, and Metabolism, 5, 397-407.
netic mouse models in the study of diabetic nephropathy. Current Diabetes Reports, 4, 435-440.
cell-pericyte ratio. Ophthalmic Research, 21, 106-111.
phometric study. 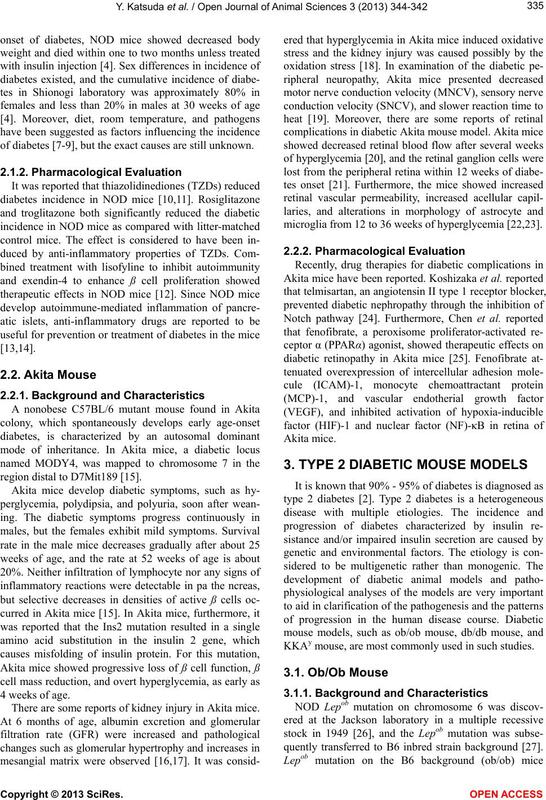 Diabetes, 29, 60-67.
and glargine on pancreatic β-cells in diabetic db/db mice. can Journal of Physiology-Renal Physiology. Chen, S., Choi, R., Kim, H.M., Lee, E.Y. and Chung, C.H. C., Chen, Y., Zhang, B., Wang, W., Lai, Y., Ma, J., Li, Z. Journal of Pharmacology, 170, 426-439. 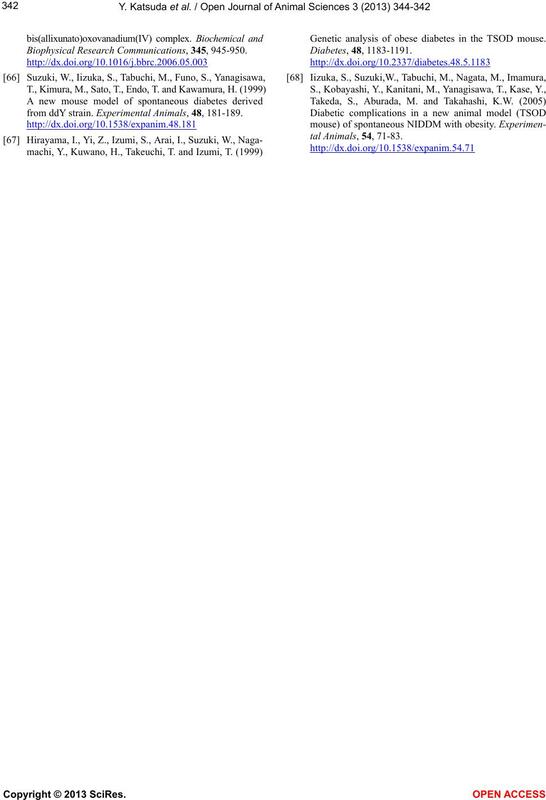 Mori, T., Nihei, T., Honda, K., Suzuki, Y. and Kawabe, Y.
ceedings of the Japan Academy, 38, 348-352.
tes mellitus. Experimental Animals, 18, 147-157.
ce of KK mice. Endocrine Journal, 17, 535-540. Iwatsuka, H., Taketomi, S., Matsuo, T. and Suzuoki, Z.
states. 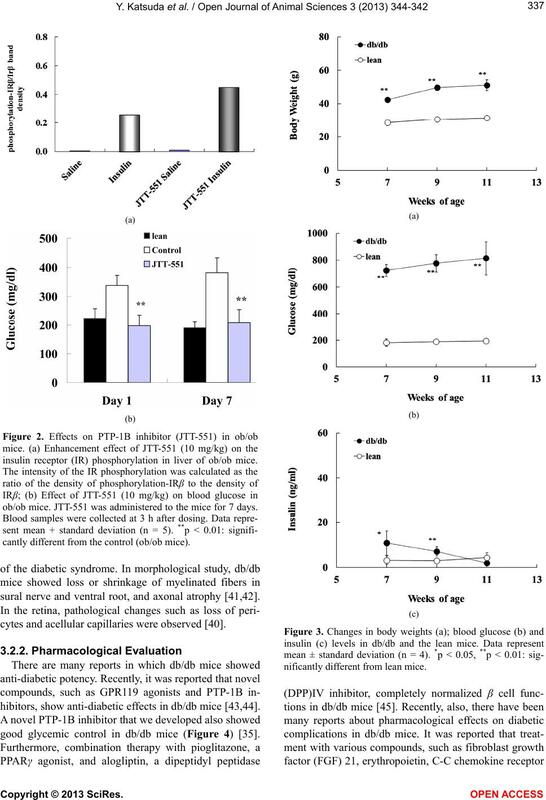 Hormone and Metabolic Research, 5, 333-339.
treatment with oral antihyperglycemic agent pioglitazone. betic agent. Diabetes, 32, 804-810.
lin resistant animals. Arzneimittelforschung, 40, 156-162. Biophysical Research Communications, 345, 945-950.
from ddY strain. Experimental Animals, 48, 181-189.